Coarda dinamica simpla 9.8mm x 60m, MADE IN GERMANY de EDELRID, celebrul producator cu o experienta de 150 de ani in domeniu, inventatorul corzii tip "kernmantel" (nucleu din toroane+manta exterioara). Coarda usoara, recomandata pentru escalada sportiva. Tratamentul THERMO SHIELD si diametrul relativ mic asigura o manevrabilitate deosebita si o fac potrivita pentru o arie larga de activitati de catarare-alpinism. Se produce in lumgimi de 40m, 50m, 60m si 70m. Culori: carrot-icemint si slate-icemint (nuanta mai albastruie). Single ropes are the most common type of climbing rope. They are the classic climbing rope, as it were. They are classic sport climbing ropes, for both outdoor and indoor use, and are also used for alpine climbing, mountaineering and by big wall climbers. One of their main advantages is their simple and uncomplicated handling. EDELRID manufactures single ropes in diameters from 8.6 mm to 10.5 mm. They weigh in at 51 to 69 grams per metre. Single ropes with a thicker diameter are generally stronger and can withstand a greater number of falls. However thicker also means heavier. For intensive use, such as working routes or top-roping, there are robust single ropes with a higher sheath proportion. In climbing safety is given highest priority. A rope is one of a climber’s most important pieces of equipment. Since the 1960s, climbing ropes have been consistently improved when it comes to materials and performance. Modern climbing ropes are made of high-quality polyamide fibres that provide high safety reserves. As such climbing ropes possess, among other things, dynamic elongation, which enable them to absorb fall energy. Dynamic ropes are primarily used for climbing, while static ropes are mainly for industrial use or big wall climbing. With its single ropes, half ropes and twin ropes, EDELRID offers a full range of climbing ropes for all types of climbers, including professionals. Whether for use at the wall, outdoors at the crag or in the mountains, EDELRID ropes are ideal for sport climbing, alpine climbing and mountaineering, big wall climbing, ice climbing and canyoning. In addition, all our ropes are made in Germany. Single ropes are the most common type of climbing rope. This type of climbing ropes provides good safety reserves whether used in the climbing gym at the crag or in the mountains. The main advantage of this type of climbing rope is its easy handling. Diameter and length determine what a single rope is to be used for. In general the following applies, the thicker the diameter, the more robust and the longer the life of the rope. Robust single ropes with a high sheath proportion are ideal for intensive use. We produce our single ropes in diameters from 8.6 to 10.5 millimetres. They weigh between 51 to 69 grams per metre. To ensure maximum safety, these climbing ropes are always used in pairs. When using twin ropes, climbers should ensure that both ropes are clipped into each bolt or piece of protection. The main advantage of twin ropes is their low weight and thin diameter. Climbers using twin ropes have more room for additional equipment on longer multi-pitch routes. These types of rope offer greater safety reserves due the increased redundancy that comes with using two ropes, for example in the event of stonefall or sharp edges. 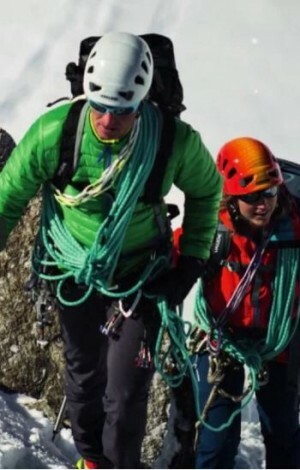 Twin ropes are often used on climbs in difficult mountain terrain and for mixed or ice climbing. Using twin ropes allows you to abseil the length of both ropes, i.e. twice as far, which allows you to escape from a wall quicker if required. Twin ropes normally have a diameter between 6.9 and 8 millimetres and weigh around 40 grams per metre. Half ropes (also known as double ropes), are designed to be used as a pair, like twin ropes. However, unlike twin ropes, half ropes do not both need to be clipped together into each bolt or piece of protection. Half ropes are used in difficult to protect terrain or in traditional (trad) climbing where the climber places all their own protection. Using a pair of half ropes is ideal for wandering routes to ensure minimum rope drag. The main advantage of half ropes is that both impact force and drag are significantly reduced. Climbing with half ropes also means that your belay device has to be able to manage two ropes simultaneously, i.e. to be able to pay out and take in both ropes. You’ll find further information about the lifespan and durability of ropes in our Rope Book. It also contains advice and recommendations for how to wash your climbing rope and how to look after it and store it. EDELRID is known by climbers for making innovative and high-quality products that guarantee maximum safety. We have many years of experience as an outdoor equipment manufacturer. From our headquarters in Allgäu, Germany we ensure that our products meet the highest demands for material and quality. As a leading climbing equipment manufacturer, we are committed to sustainable and environmentally-friendly production. All EDELRID climbing ropes are manufactured in Germany.